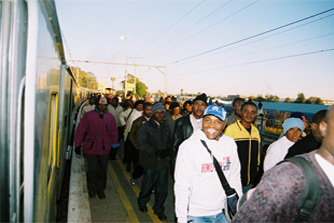 Metrorail is responsible for transporting up to 2 million passengers daily in the following operational areas: Gauteng, Western Cape, KwaZulu-Natal and Eastern Cape. The PRASA owns 317 stations of the 468 stations Metrorail operates, with the remainder belonging to Transnet Freight Rail, and provides commuter rail services on 3180 kilometres of track of which it owns 2228 kilometres and Transnet Freight Rail the rest. Travelling on the Metro network is easy. Just determine which station you will be starting and ending your journey, the time of day, how often you'll be travelling - there's a range of tickets designed to suit your needs – single, return, weekly and monthly tickets. Purchase your tickets at either the station ticket office or from Metrorail Ticket Officials with portable ticket machines.